From Bough Down, Karen Green, 2013. Siglio Press. Copyrighted by the artist. For several years during childhood, my younger brother and I shared a room. When silence eventually fell after we’d been put to bed, I often began to worry. If I couldn’t hear his breathing, if he didn’t shift in his sleep or answer my urgent whispers (“Hey … hey … ” “What?” “ … Nothing”), I willed myself motionless, listening for signs of life. If I still couldn’t hear anything, I got up, tiptoed across the room, and leaned over him. He was never not breathing. Yet I continued these fretful nocturnal journeys throughout our childhood. As we grew older, my concern became more practical. I wondered how I would react if I found his breath had stopped, what course of action I would take, and whether I would be able to even move from the spot where I’d be helplessly rooted to the floor. I was haunted by his possible death—an absence I could not understand as a child—and by my inability to conjure a suitable reaction. I do not fear my own death as actively as I worry about being left to cope with the death of someone I love. And while I have lost loved ones, I’ve managed, because those deaths made sense, to hover at the edges of grief. From there, I watched others muck through it, station to station. (Inevitably, I imagine each of the stages of grief less as a pilgrimage than as suburban park trail, where Denial is a set of monkey bars, Anger a stepping post, etc. Mourning, to me, is a compulsory obstacle course.) From the safety of the path, so to speak, I found myself rationalizing away what felt like an improper response to loss with the argument that we all manifest grief differently. In my case, I insisted, it was by maintaining my distance. As a consequence, I have avoided mourners. I’ve skipped out on funerals. In shameful moments, I’ve forsaken those in need. Never because I didn’t care, I insist, but because I am too weak. And so I didn’t want to read Bough Down, Karen Green’s memoir of loss and mourning. Despite myself, I brought the book home and put it on the shelf, where I intended it to remain, a vellum-shrouded apotropaic object, its presence enough to ward off misfortune. Yet I was drawn to it. Not out of morbid curiosity—rather, it was the object itself, an evocative, elegantly designed book, that lured me. Its translucent dust jacket overlays a ghostly collage; it is printed on thick stock, giving it thoughtful weight. Those of us under the sway of books understand that these are not insubstantial qualities for an object to possess. I found myself reading it. First in pieces, dipping into a few pages over morning coffee, a handful at lunch, maybe a passage or two before bed. I kept a novel nearby as a safeguard, in case I found myself pulled too close. I was never “reading” Green’s memoir, even as I read it. My casualness was deliberate, though it proved ineffective. As much as I hoped approaching the book at random in this way would keep me from falling under its spell, I returned to it again and again, until it was, suddenly, done. Upon reaching the end of the book, where Green confesses in the last line that she “can’t wrap this up,” I skimmed the pages under my thumb and returned to the beginning. I am mean and I am suffering and I need more help than you but you are like the moon; you shed light on my insignificance from a great, wordless distance. The graceful handling of the tension between emotion and its articulation is among the reasons Green’s work feels destined to become a classic. Bough Down exposes the contradictions and ambiguity of what in less sensitive hands would verge on the sentimental. It’s reductive to say, I know, but a great work of art demands honesty—however veiled. In acknowledging this messiness, Green doesn’t shy away from the absurdity of being left to live after. At times, while reading, I could almost feel a shuddering: the widow bracing against herself, her dead husband, even the well-meaning “support guys” whose good intentions clutter her path toward recovery, if that’s what it’s called. Any time she slides toward self-pity, she cuts herself off. What strikes me as most admirable is Green’s ability to manifest her grief, to inhabit it fully, while at the same time existing beside or beyond it, locating and isolating its patterns under her unequivocal gaze. I call the doctor: I am suffering, it’s embarrassing, and I need I need I need. He says something back. He says ginger beer, hot bath, sanctuary, but I cannot breathe in the bath; I resent my floating body’s demands, spleen and bowel and aperture; there is no refuge in architecture, don’t patronize me. The doctor says if you were so quote perfect for me unquote you’d probably still be around, no offense. Bough Down also includes several dozen miniature collages. 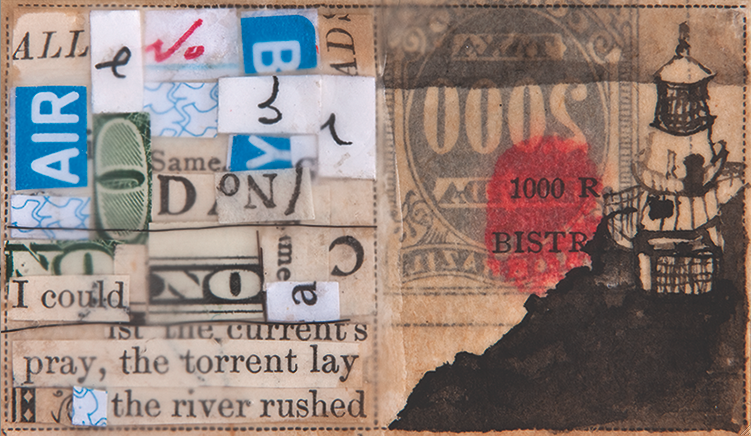 Many of these pieces resemble postage stamps: Did Green intend them as the payment necessary to send her words to the man now lost in the great, wordless distance? 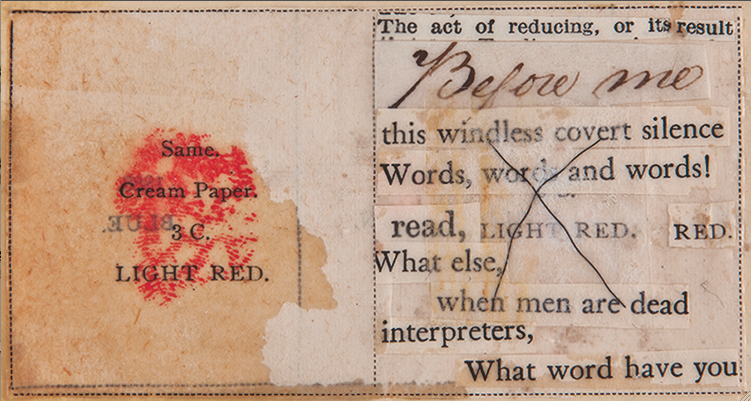 Layered upon these stamps are strips of text—lines appropriated from Marianne Moore, Thoreau, and others—that are washed out or painted over, obscured by fog, as if to say, This is not enough. The collages complement the text, illuminating a world that for Green has lost vibrancy. Color, or rather the intense desire for it, streaks through the book. Whereas once she “sorted unimaginables by color,” Green, who found herself in the most unimaginable situation, is left groping for color as if for salvation. Her dead husband’s arms appear an “irrational color.” In an incantatory passage, she writes that “Merle is a color and merle is a bird but merle is not that color of the bird, it is a bluish or reddish gray mixed with splotches of black, the ‘color of the coats of some dogs.’” This longing for the return of color is felt most keenly in several of the collages, which dissonantly list names in wrong colors—light red written in green, brown spelled backwards in blue—as if evidence of Green’s failed pursuit of meaning. A friend who recently lost two family members in an accident confessed that she is now “muscling through the days” by focusing on her sport. Green, too, reminds us that grief is not only of or in the mind, though it may flash most vividly there. Grief is in the body, in the air; it leaves its patterns on familiar items: “His pillow is a sweat-stained map of an escape-plot, also a map of love’s dear abandon.” The couples’ dogs sense it and react. Uncomprehending, they pad into the narrative again and again, often the realest creatures in a book of ghosts. Let’s circle to show him how much we love the word walk. Don’t get mad. Is he crying? Say the word. Something smells wrong in the yard; it smells like revenge. His voice is gentle but the fur on my back is up. Are we in trouble? He is up too high, and we pledge our allegiance, so bite at the tennis shoes. But we are not allowed to eat shoes anymore. Pull down. Strong square jaws designed to pull down. No, howl and bark until all paws levitate and summon her at the window. Windowcarwindowyardwindowwindow. If I didn’t want to read Bough Down, I certainly didn’t want to write about it. It has something of the sacred about it, something I should know better than to touch. I’m not a critic: I don’t think every creation demands an articulated response. But I found myself circling the book. I wanted to say something. Is it immodest to use someone’s loss as a magnifier of my anxieties? Is it selfish to filter my response to death through the prism of Green’s grief? When Green came into Green Apple Books in San Francisco, where I work, to sign copies of Bough Down, I asked her, perhaps tactlessly, how it felt to now exist in the world alongside her book. She answered as if she had already considered the question—or had been asked it already. She looked at me, then at the stack she’d just signed, and said that she could only think of the book as an object. It was there, she said, with that there sounding as if it referred to a remote place. That conversation cemented my feeling that for all that is deeply personal about Bough Down: the book is an argument against the contingency of life. It doesn’t contain a line of advice. It doesn’t dispense with hard-won wisdom. Yet in its honest refusal to gloss over the occasional ugliness and pain of continuing in a world marked by “absence grown immortal,” it offers consolation. Its fragile, luminous beauty lights the way, bringing color to a world gone dim. Though I hope I never have to return to it in a time of need, I find great comfort knowing it’s here. Stephen Sparks is a bookseller and writer in San Francisco.